But if you’re into hiking and exploring the outdoors, you should absolutely try snowshoeing this winter! Two of the biggest perks of snowshoeing, for me anyway, is that you get the chance to immerse yourself in a picture perfect winter wonderland and the trails are usually way less crowded than in the warmer summer months. 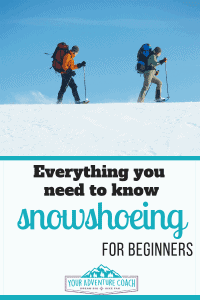 Follow these snowshoeing tips for beginners to help make your first trip a success. Luckily, your snowshoeing equipment doesn’t look too much different than your regular winter day hiking equipment – except, of course, the snowshoes! Check out this post on winter hiking essentials to make sure you have the basics covered. 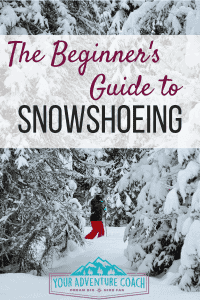 Then you’ll want snowshoes to help keep your legs and feet from ‘post holing’ or creating super deep, skinny holes in the snow that you then have to drag yourself out of. 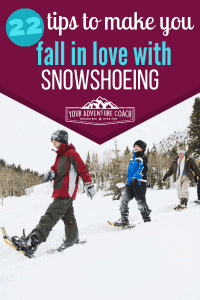 Snowshoes will help keep you afloat on top of deep snow so you can keep moving forward. 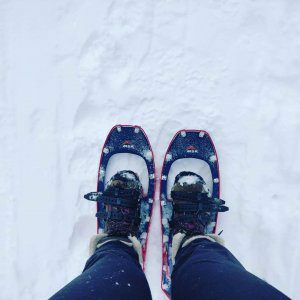 Snowshoes will have pretty decent spikes on the bottom to help you dig in when going up or down hills, or traversing across a steep slope. You may also want trekking poles with snow baskets on the bottom to help you keep your balance, and help you get up and down hills more easily. That being said, you don’t need poles, especially if you’ll be sticking to easy, flat trails in the beginning. I definitely recommend using poles though for steep climbs. If you already have trekking poles, you can buy snow baskets for them for cheap – just make sure to get snow baskets that fit your brand and style of trekking pole. 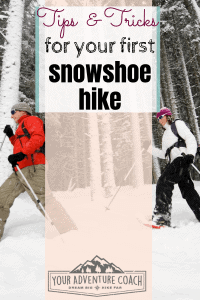 Honestly, if you’re brand new to snowshoeing – I recommend renting snowshoes before you buy them. Snowshoes are not cheap to purchase, but you can usually rent a pair for a day for about $15-25 to test them out and see if you really do like snowshoeing as much as you do hiking. What kind of terrain will you be snowshoeing on? If you’ll be on mostly flat terrain, you won’t need nearly as much traction as you would if you were going to be climbing mountains and bagging peaks. The bindings on flat terrain snowshoes are usually easier and quicker to use, but not quite as sturdy or secure as the bindings on rolling terrain or mountain terrain snowshoes. All in all, if you’re new to snowshoeing and will be sticking to easier trails, go with flat terrain snowshoes. However, if you live in an area close to big mountains or think you’ll end up snowshoeing the steeper hills one day – why not make the investment once and get some solid rolling terrain or mountain terrain snowshoes. That’s my goal anyway, to just buy gear once instead of having to upgrade it after a season or two. Once you know what kind of snowshoe you want, you’ll have to choose a size. 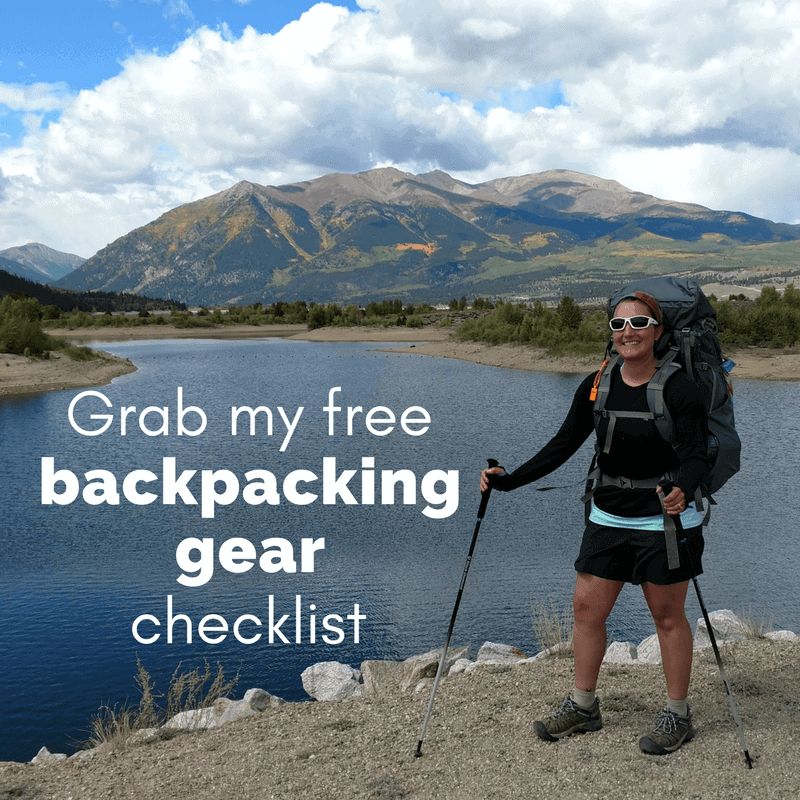 This is pretty straightforward and is based on your weight + the weight of your gear. The heavier you are, the bigger/longer snowshoe you’ll need to keep you from sinking deep into the snow. But don’t go assuming biggest is best here, you’ll want the smallest size you can get for your weight range. The longer or bigger the snowshoe, the harder and more annoying it will be to maneuver on uneven terrain. Especially if you’re a woman, I recommend buying women’s specific snowshoes since they are usually a little narrowing and built for a woman’s frame and gait. If you ever feel like your snowshoes are not quite supporting you enough when you travel through deeper powder or may be carrying a heavier pack, you can buy snowshoe tails to add on extra length and surface area to your snowshoes. For most occasions, you don’t special snowshoeing pants or clothes – your regular synthetic hiking clothes will probably be just fine, with a few variations. Layers are your friend! But not too many layers, because snowshoeing’s hard AF sometimes and you’ll be creating a ton of body heat. I usually wear a pair of synthetic leggings or long john’s (if people still call them that?) under my regular synthetic, Exofficio hiking pants. If you’ll be going through particularly deep snow or it is snowing pretty hard out, you might want to add on snow pants or rain pants to keep the wet snow off you. Or a pair of knee-high gaiters would work as well in deep snow. Then on top, I layer a long sleeved synthetic t shirt under a fleece or warm fuzzy sweatshirt. 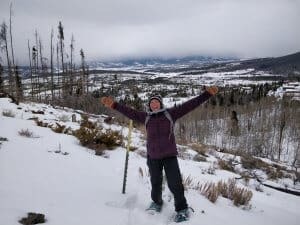 Then I bring along a warm puffy coat and my rain coat to put on to help block the wind or precipitation, but usually the puffy coat and rain coat are overkill – like I said – you create a lot of heat snowshoeing! You’ll also probably want gloves, a fleece neck gaiter and a warm hat. Even if some of those end up going in my pack, I’d always rather have them than not have them. You’ll definitely want good winter boots or waterproof hiking boots for snowshoeing. Your feet will be in the snow and will get snow on them, if you’re out for a long time, that snow will cake on and/or melt and your feet will be wet and cold if you’re not proactive about this. I wear high cut, waterproof, Keen winter boots. I love them because they fit and feel just like my Keen hiking boots – but winterized. I also use Superfeet insoles to keep my feet happy on long hikes and I just recently discovered Superfeet also makes warmer, wool insoles to help keep your feet extra insulated during winter hikes. Each style of binding works a little differently and each has their pros and cons, for example some the lighter, more comfortable bindings might not be as sturdy or durable as the heavy duty bindings made for steeper mountain terrain. Here, MSR goes over a few different kinds of snowshoe bindings and how to put on your snowshoes correctly. Make sure you don’t have your bindings tightened too much, or this will restrict blood flow to your feet, making them very cold! I’ve had this happen before and my feet started to warm up again almost instantly after adjusting my binding straps. Although sometimes…. your feet will just be cold because winter. But it’s worth trying to loosen up your straps to see if that’s the issue first before just chalking it up to the weather. Start on easy, flat trails if you can, to get used to walking in snowshoes. They can be a little awkward at first since you may have to keep your feet a little wider apart than usual. Use trekking poles with snow baskets on the bottom of them, if you can, for extra balance. Poles are not ‘required’ to go snow shoeing, but like I said, can help with balance if you feel like you need it. Follow in someone else’s tracks when you can, while you get used to the snowshoes. It can get pretty exhausting breaking through fresh snow for the first time on your own. After you get used to the snowshoes, take turns leading if you’re in a group, to give the first person a break from stomping down the trail for everyone else. Snowshoeing is hard work, harder than just regular walking/hiking, take lots of breaks to catch your breath, but not so long of a break that you get really cold – that can happen quick once you stop moving. Bring snacks and water. It will probably take you longer to snowshoe 5 miles than it would to hike the same 5 miles without snow, so plan extra time, water and snacks accordingly. Wear waterproof shoes or winter boots if you have them. It’s not uncommon that I’ll kick snow up on my legs while snowshoeing, so wear gaiters, rain pants or snow pants to keep snow from caking up on your pants or falling into your boots. Or if it’s real windy, these make a great extra layer. Bring all your usual day hiking gear, first aid kit and emergency supplies – but especially a head lamp and fire-starting supplies. Like I said, snowshoe hikes can accidentally run longer than expected and you do not want to be stuck out in the snow in the dark! If you enjoyed this post, share it and tag your winter hiking buddy!